Rani Lakshmibai was born on 19 November 1828 in the town of Varanasi into a Marathi Karhade Brahmin family. She was named Manikarnika Tambe and was nicknamed Manu. Her father was Moropant Tambe and her mother Bhagirathi Sapre (Bhagirathi Bai). Her parents came from Maharashtra. Her mother died when she was four years old. Her father worked for a court Peshwa of Bithoor district. The Peshwa called her "Chhabili", which means "playful". She was educated at home and was more independent in her childhood than others of her age; her studies included shooting, horsemanship, fencing and mallakhamba with her childhood friends Nana Sahib and Tatya Tope. Manikarnika was married to the Maharaja of Jhansi, Raja Gangadhar Newalkar, in May 1842 and was afterwards called Lakshmibai (or Laxmibai) in honour of the Hindu goddess Lakshmi and according to the traditions. She gave birth to a boy, later named Damodar Rao, in 1851, who died after four months. The Maharaja adopted a child called Anand Rao, the son of Gangadhar Rao's cousin, who was renamed Damodar Rao, on the day before the Maharaja died. The adoption was in the presence of the British political officer who was given a letter from the Maharaja instructing that the child be treated with respect and that the government of Jhansi should be given to his widow for her lifetime. After the death of the Maharaja in November 1853, because Damodar Rao (born Anand Rao) was an adopted son, the British East India Company, under Governor-General Lord Dalhousie, applied the Doctrine of Lapse, rejecting Damodar Rao's claim to the throne and annexing the state to its territories. When she was informed of this she cried out "I shall not surrender my Jhansi" (Main meri Jhansi nahi doongi). In March 1854, Rani Lakshmibai was given an annual pension of Rs. 60,000 and ordered to leave the palace and the fort..
Four days after the massacre the sepoys left Jhansi, having obtained a large sum of money from the Rani, and having threatened to blow up the palace where she lived. Following this, as the only source of authority in the city the Rani felt obliged to assume the administration and wrote to Major Erskine, commissioner of the Saugor division explaining the events which had led her to do so. On 2nd July, Erskine wrote in reply, requesting her to "manage the District for the British Government" until the arrival of a British Superintendent. 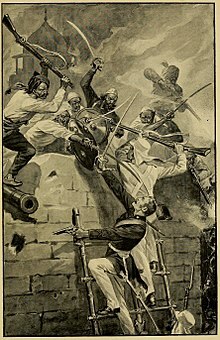 The Rani's forces defeated an attempt by the mutineers to assert the claim to the throne of a rival prince Sadashiv Rao (nephew of Maharaja Gangadhar Rao) who was captured and imprisoned. There was then an invasion of Jhansi by the forces of Company allies Orchha and Datia; their intention however was to divide Jhansi between themselves. The Rani appealed to the British for aid but it was now believed by the governor-general that she was responsible for the massacre and no reply was received. She set up a foundry to cast cannon to be used on the walls of the fort and assembled forces including some from former feudatories of Jhansi and elements of the mutineers which were able to defeat the invaders in August 1857. Her intention at this time was still to hold Jhansi on behalf of the British. Khoob Ladi Mardaani...Jhansi Ki Rani (2019), a television series airing on Colors TV starring Anushka Sen as Rani Lakshmibai. ^ Meyer, Karl E. & Brysac, Shareen Blair (1999) Tournament of Shadows. Washington, DC: Counterpoint; p. 138--"The Rani of Jhansi ... known to history as Lakshmi Bai, she was possibly only twelve in 1842 when she married the .. Rajah of Jhansi ..."
^ Though the day of the month is regarded as certain historians disagree about the year: among those suggested are 1827 and 1835. ^ Copsey, Allen. "When was she born?". 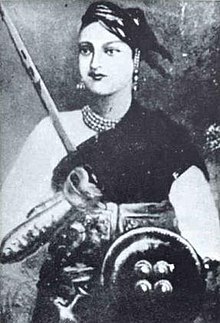 Lakshmibai, Rani of Jhansi. Retrieved 28 June 2014. ^ The 177th anniversary of the Rani's birth according to the Hindu calendar was celebrated at Varanasi in November 2012: "Lakshmi Bai birth anniversary celebrated". Times of India. World News. 13 November 2012. Retrieved 6 December 2012. ^ "The Washington times. (Washington [D.C.]) 1902-1939, April 16, 1922, SUNDAY MORNING, Image 24". 16 April 1922. p. 5 – via chroniclingamerica.loc.gov. ^ Later in his life Moropant Tambe was a councillor in the court of Jhansi under his daughter's rule; he was executed as a rebel after the capture of the city. "Lakshmibai, Rani of Jhansi; Victims". Allen Copsey. Retrieved 17 May 2013. ^ N.B. Tambe and Sapre are clan names; "Bai" or "-bai" is honorific as is "-ji" the masculine equivalent. A Peshwa in a Maratha state is the chief minister. ^ Agarwal, Deepa (8 September 2009). "Rani Lakshmibai". Penguin UK – via Google Books. ^ Godse, Vishnu Bhatt. "Godse's account". Lakshmibai, Rani of Jhansi. Allen Copsey. Retrieved 6 December 2012. ^ "Lakshmibai, Rani of Jhansi; Timeline". Retrieved 3 June 2015. ^ The English version of the notice reads: "Rani Jhansi jumped from this place on horseback with her adopted son"
^ "Jhansi". Remarkable India. Retrieved 27 October 2012. ^ Allen Copsey. "Brigadier M W Smith Jun 25th 1858 to Gen. Hugh Rose". Copsey-family.org. Retrieved 7 July 2012. ^ Edwardes Red Year: one of two quotations to begin pt. 5, ch. 1 (p. 111); History of the Indian Mutiny was begun by John Kaye but Malleson both rewrote parts of it and completed the work. ^ The whole memoir was published in Marathi in Kelkar, Y. N. (1959) Itihasachya Sahali ("Voyages in History"). It is likely that this text is a written version based on tales of the prince's life in oral circulation and what actually happened to him remains unknown. ^ Sen, Indrani (2007). "Inscribing the Rani of Jhansi in Colonial 'Mutiny' Fiction". Economic and Political Weekly. 42: 1756. ^ Sen, Indrani (2007). "Inscribing the Rani of Jhansi in Colonial 'Mutiny' Fiction". Economic and Political Weekly. 42: 1759. ^ Sen, Indrani (2007). "Inscribing the Rani of Jhansi in Colonial 'Mutiny' Fiction". Economic and Political Weekly. 42: 1757–1758. ^ Sen, Indrani (2007). "Inscribing the Rani of Jhansi in Colonial 'Mutiny' Fiction". Economic and Political Weekly. 42: 1758–1759. Jerinic, Maria (1997). "How we lost the empire: retelling the stories of the Rani of Jhansi and Queen Victoria". In Homans, Margaret; Munich, Adrienne (eds.). Remaking Queen Victoria. Cambridge University Press. ISBN 9780521574853.